OpenLab London :: What is Free Software? Free Software, or Open Source (as it’s also known), refers to programs which are released along with the source code used to make them. This gives the users the freedom to modify or extend the software themselves as they see fit. Programs released this way are also generally free in cost too. Free, open source software (sometimes shortened to FOSS) encourages vibrant communities, consisting of developers and users of the program – sometimes the boundaries are hard to define. Free software is particularly interesting for artists using computers, as it provides greater possibilities to learn and take control of your work, in contrast to where the source code is protected and hidden away from you. What artistic free software is available? Pure data is probably the most popular framework used by OpenLab members. Pd is a real-time music and multimedia environment, written by Miller Puckette, originally for creating music and now extended by many people for various tasks, including 2D/3D graphics streaming. 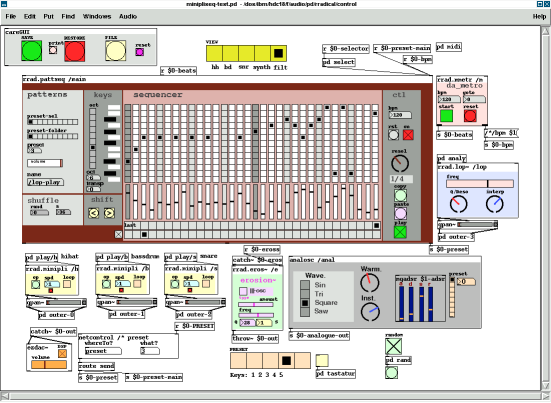 A puredata patch by Frank Barknecht. Some software is written as an artistic act. Some of this is also free software. Runme is a repository of software art. What software do OpenLab members use, and why? I use fluxus for nearly everything now, along with a bunch of different layers and environments built on fluxus for livecoding, for example: Al Jazari and Daisy Chain are current favorites. One other application that’s such a part of my toolkit I always forget to give it the praise it deserves: the timemachine. I mostly use Pure-Data and plan on getting going with PiDiP for the visual end of things. Also, I am learning (slowly) SC3. I use Fedora Core 2 as an operating system with the Planetccrma low latency kernel. I have been writing software in C (and occasionally C++ when necessary to integrate with a C++ based library) Originally I ignored interfacing to the real world, just dumping data to a file which could be played subsequently. Lately , through the magic of ‘open source’ and/or ‘free software’ I have been able to reap the fruits of others’ labour and use some libraries such as portaudio and libsndfile to get sound to come out the speakers without having to know how the hardware interface works or the file format. THe fast, light tool-kit fltk helps generate some basic gui widgets and the ever-popular secret rabbit code provides some fancy sample stretching tricks! Since seeing OpenLab#1 at the foundry, I have tried out pd, and it is just what I was looking for after getting fed up with the non-open-non-free softstep program. What are our draconian rules for software use? We are not free software zealots (well, not entirely :) but OpenLab exists to promote open source software, so while using things like non-free operating systems is fine, there should be some element of your work which exhibits these ideals (usually the environment you create your work in).